This morning, the channels flood in. 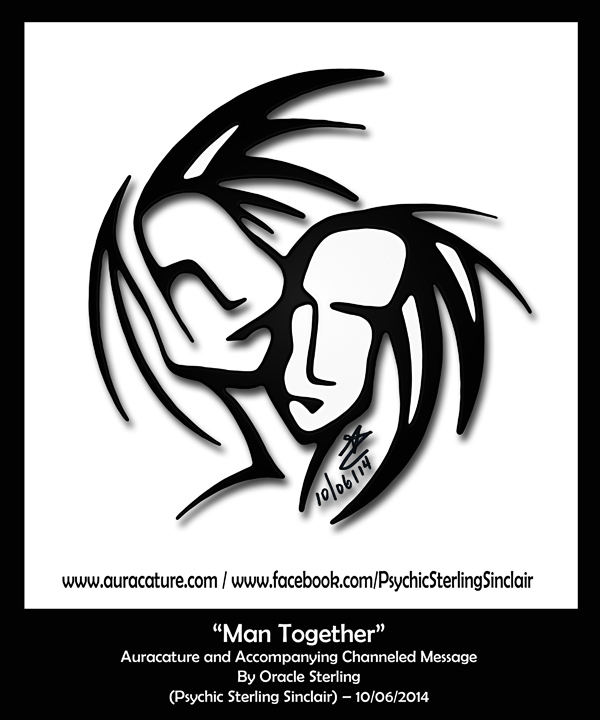 This one wrote itself upon the page before the corresponding Auracature “Man Together” was recorded. “The skies crush open the mountains in the East. He who walks past his path pushes pathetic plows of pontification. Where are the men who stand up for other men? When did brotherhood get lost deep beneath the warrior medals in grandfather’s trunk? To hold a man’s hand, whether he be boy or better man, holds promise of violent brutalities’ demise. Man struggling to hold man. I wash my hands upon His fountain, for only the purified heat of his hydrant of healing shall my food reach my mouth mischievously mistaken. Mere moth wings mumble upon His mother’s breast. Suckle life that grows lush deep at the base of the eastern mountains. You will never reach the top, My men, if My offerings are not consumed. Turn around if you missed your path and the hill has become too steep to climb. The sign posts have changed but the path remains the same. Rest in My tea and wrap within my jungle. Experience your quivering thighs and when your hands begin to shake, get up and walk again. Remember, a circle walked produces an East that soon becomes a West. Chin up my dear friends.